U.S. Treasurer Rosie Rios may have won the fight to put a woman on currency, but she said that overall America has "taken steps back" in the fight for gender equality. It was Rios' persistence over six years that led to Treasury's announcement earlier this year that Harriet Tubman will be the next face of the $20 bill, marking the first time a woman will appear on U.S. paper money in more than a century. When she first started lobbying for the change, Rios said, "I asked, 'Why wasn't this conversation happening sooner?' I kept getting the same answer, that nobody ever brought it up." As Rios prepares to leave her post as Treasurer, she says there is far more she plans to bring up. "I feel like we have so much more to do, whether it's women on corporate boards, women in the C-Suite, or women in congress. We have taken steps back," she said at a Women's Entrepreneurship Day forum in New York on Monday. She pointed to statistics like those recently released from research firm Catalyst that show women have made little progress gaining leadership roles at major companies. Rios has experience climbing the ranks in the private sector. Before she moved to D.C. in 2008, she was managing director of investments at a firm in San Francisco. She hopes that more women will be able to share stories like her own by 2020 -- which is the 100th anniversary of women winning the right to vote and the year Treasury will unveil a redesigned $10 bill that will also include a woman's portrait. She offered a few pieces of advice to women in the workplace. Rios was raised by a single mother who worked as a caterer and still sent Rios and her eight brothers and sisters to college. That is who Rios credits with showing her that women are equally capable as men. "It really is the strength, this fortitude, this courage that I saw in my mom," Rios said. "She never hesitated. There were very little inhibitions, there was nothing that really stopped her." 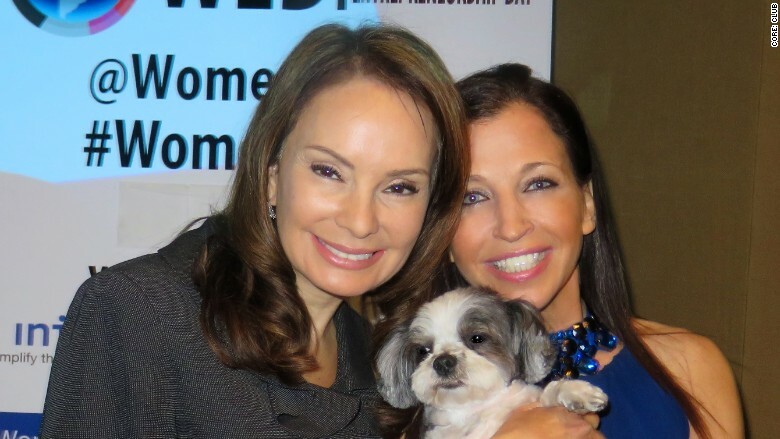 Rosie Rios, left, joined Women Entrepreneurship Day founder and animal rights advocate Wendy Diamond at a forum at New York's Core: Club on Monday. Rios said women should look to be "constructive disruptors." "I'm not just banging my fists on the table, saying, 'We need women, because we need women,'" she said. Instead, be "deliberate and strategic and organized" and make informed recommendations. During her stint at Treasury, for example, Rios says she has read Treasury Secretary Jack Lew's briefing material -- a three hour endeavor -- every day. "It may include a bunch of stuff that's not in my portfolio, but I want to know what they're talking about and I want to speak that language," Rios said. "Don't walk into a meeting unprepared." And during those meetings, women should be prepared to speak up rather than sit on the sidelines, Rios said. She pointed to a piece of advice her mother once gave her: "Never ever forget that you earned that place at the table. No matter what table that is -- whether it's a business table, a dining table, a community table." "Participate. Don't just take notes," Rios added. "Don't just serve as a resource. Be active."